What a difference a week makes. When we checked in last week, only 4 teams were classified as locks, with another 4 slotting into the near-lock category. This week, we're up to 16 locks and another 11 near-locks. A week ago, 74 teams fit the broad definition of being bubble teams--those with between a 10% and 90% chance of making the Tournament; today, that number is down to 50. 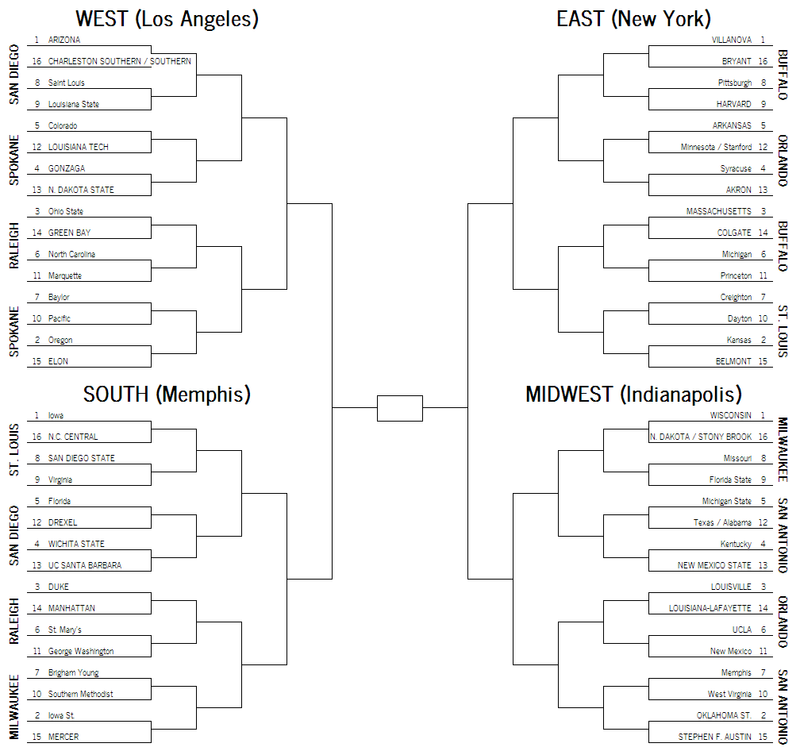 The following bracket (click it to see full size) is based on the TAPE projection for the rest of the season. Teams are ranked according to the simple sum of their projected year-end RPI rating and their TAPE rating. The next five teams that didn't make the cut this week: Xavier, Clemson, Boise State, Connecticut, and Georgetown. Conference-by-conference breakdowns are after the jump. VCU's loss at Northern Iowa last Saturday pushed them out of the Tournament field for the first time this year, and all the way to the edge of the bubble. The Rams need at least a dozen more wins to make the field. Clemson would have been a 9-seed if this was published yesterday, but a loss to a bad Auburn team dropped the Tigers out of the field for now. NC State's win at Tennessee has the Wolfpack inching closer to the bubble. Connecticut's exclusion from the field highlights the limitations of doing this kind of analysis this early in the season, but it also points out what a fine line the Huskies are poised to walk. Three one-point wins over good teams have the Huskies ranked in the top ten of both polls, but several closer-than-they-should-have-been wins over not-so-good teams leave TAPE skeptical about their strength. UConn will probably make the field of 68, but there's a good chance they'll be mighty overseeded when they get there. Any slip against the bottom half of the league could have dire consequences for any of the AmCon's bubble teams. Texas was one of the biggest movers this week, going from the bad side of the bubble to the good with their win in Chapel Hill. The Longhorns are looking good for a bid to the Tournament--nine more wins should do the trick--but their seeding will be wholly dependent on whether or not they're able to notch another couple wins against top teams. With 8 conference games against the Jayhawks, Cowboys, Cyclones, and Bears, plus Michigan State's trip to Austin tomorrow, they'll have plenty of opportunities to do so. Xavier's game at Alabama tomorrow might be the key to both teams' seasons. The loser will have to make up a ton of ground in conference play, while the winner will be well-positioned to earn a spot in the field of 68. The Big Ten might top out at six bids just because it'll be so hard for that league's bubble teams to rack up enough wins to catch the Committee's attention. TAPE identifies both Penn State and Indiana as top-50 teams, but both will have RPI ratings outside the top 60 unless they can finish better than .500 in league play. Drexel's loss to cross-town rival St. Joe's on Wednesday means that the Dragons probably can't lose more than one game before the CAA Tournament in order to merit at-large selection. Any of these three teams would have to romp through a depleted Conference USA with no more than one or two losses to earn an at-large bid. That's hard enough for teams like Drexel or Green Bay to do in leagues without another strong team; the presence of two other decent-ish teams in the same league makes it all that much harder for any one team to do so. See the comment on Drexel, but substitute "Eastern Michigan" for "St. Joe's." Could this be the year that the Ivy earns an at-large bid? Harvard's been on the radar from the start, but Princeton--whose only loss was by 3 points at Butler--deserves serious consideration for inclusion as well. The winner of tonight's battle with fellow bubble team Pacific should control their own destiny for an at-large berth. Much like Conference USA, the MAC has a group of good-but-not-very-good teams who will likely cannibalize each other's chances at an at-large bid. Drake and Indiana State share the same path to the NCAA Tournament: beat Wichita State at least once, don't lose more than twice to anyone not named Wichita State. There seems to be some surprise among college basketball pundits that the Mountain West hasn't been able to replicate its success of a year ago, but it was entirely predictable. That league was full of seniors last season, and a bunch of teams bubbled up all at once to form an abnormally strong league. It's back to normal for the MWC this year. Even an undefeated Ohio Valley campaign probably wouldn't be enough to guarantee Belmont a spot in the Dance. The Pac-12 has four really good teams, but it's a top-heavy league. The Cardinal, Sun Devils, Golden Bears, and Utes will all have opportunities to earn signature wins. Arkansas is classified as a near-lock here, but they're probably overrated. The Razorbacks have yet to play a true road game--and won't until a trip to College Station on January 8--and Mike Anderson's teams always have a much wider than normal home-road split that TAPE doesn't have any way of accounting for (yet--I'm working on it). The chances are that at least one team that's in the near-lock category will miss the Dance, and I wouldn't be surprised if Arkansas is that team. The Bison have a signature win at Notre Dame, but still probably can't lose before the Summit league tournament in order to merit at-large selection. That's too high. If you lose to a SWAC team, you have to win your conference tournament to go dancing. I'm pretty sure that's in the bylaws somewhere. The Aggies have a signature win at New Mexico, but still probably can't lose before the WAC tournament championship game in order to merit at-large selection. Pacific is in a good position. They've already banked a road win over another bubble team at Utah State, and they've moved up to a league that will give them six chances to pick up wins against NCAA Tournament teams. If the Tigers can pick up one or two wins against Gonzaga, St. Mary's, and BYU and avoid more than a couple slip-ups against the rest of the WCC, they'll have a great case come Selection Sunday.